Cat Watch: Gift from Erin. Black Satchel: c/o Handbag Heaven. I'll never forget one moment that changed my body image forever. I was a competitive swimmer from the age of 6 to 16 so I spent a lot of time in a bathing suit. Growing up I was never stick thin, but as I hit my preteen years my body really slimmed down and toned up with the help of the rigorous swim practices. Around that time I was still on the heavier side but starting to gain confidence in my body as it grew more fit. Then I was given a big set back. I was at a meet one day for a summer team and my relay team, a group of three other girls and I, were standing behind the blocks waiting for our event to start. We were just casually talking and then, one of the girls looked at me up and down in my swimsuit and got this smug look on her face. She glanced down at her thighs and smiled and said, "you know, if your thighs touch, you're not skinny." Of course she had a perfect, wide gap of space between her toned and tanned thighs and I looked down at mine. A young girl who in that instant, knew that her thighs didn't touch and they would never not touch. Probably 10 years later and this occurrence still is so vivid in my memory But you know what this post is for? To say screw that and those standards. I don't care if it's hip to have a thigh gap. I don't care if I'll never have one and my thighs over lap and then some. I'm glad that through the past few years I've been able to not care about a dumb thigh gap and realize my thighs are perfect the way they are. I embraced this sentiment by buying these high waisted jeggings over break that show every single curve and bump on the lower half of my body. But I like them because this looks like me and it looks like the thighs, stomach, and hips and behind that I've grown to love. Whether you have a thigh gap naturally or you don't; love that lower half of yours. It's the only one ya got. Lovely post Lauren! I get watcha mean! Girls are super obsessed about that darn gap. But why? The human body is just amazing the way it is, so if your thighs touch celebrate it! The media man, its powerful! Lauren, it never fails to amaze me how you always post about something that is relevant to me at just the right moment! I was debating about whether or not to go to a weekend-long retreat with my church youth group, but I was so scared to go I said no because I knew we were going to the swimming pool and I'm SO wretchedly self-conscious about how fat and flabby I look in a swimsuit, how my skin has acne marks on the back, basically how all my insecurities are shown in a swimsuit. I felt like no one could ever like me or be my friend and I was so worried and focused on this I decided not to go and to miss out on the whole weekend! I was sitting in my room, sad, and decided to look at your blog, and you changed my whole attitude and I think I might even be brave enough now to call and say I will go. Thank you for giving a little touch of confidence, wisdom, and perspective, and you're right, Lauren, you are perfect just the way you are. You have no clue how much your posts help me as I try to get through these teenage years. I'm European reader! !From Italy(Lecce city)...I do not speak English...ciao! Yay Lauren! Thank you for this post! I remember discovering the 'thigh gap thing - before my thighs were just that, my thighs, but then there was suddenly this ideal that your thighs were 'supposed to be' - crazy! I now have the same sentiment as you that so what if they touch? That's just the way they are and it really doesn't make a difference! Loving your outfit too by the way, really classic and lovely :) And your hair looks gorgeous in the last pic! First of all, lovely outfit! 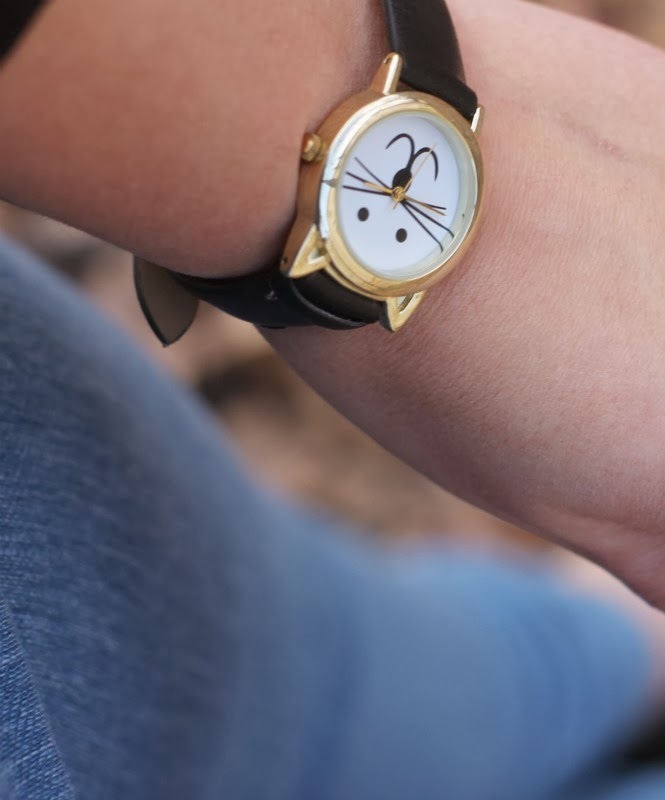 I just adore that cat watch. Secondly, kudos to you for embracing who you are and buying those jeans. I'm a dancer, and I'm not fat, or skinny, but kind of in between and my thighs do touch. I hate it when I see girls that seem to have miles between their super skinny thighs, but then I realize I am perfect the way God made me, and I will live with that. You are perfect too! I never understood the thigh gap thing, sometimes you can actually be 'skinny' and youre supposed to have it but you don't because of the way your bones are, or because of your hips. Its kind of dumb. We should all just love what we got! Wow, you look totally phenomenal in high waisted jeans. You look so chic, and that's not a word I really use. 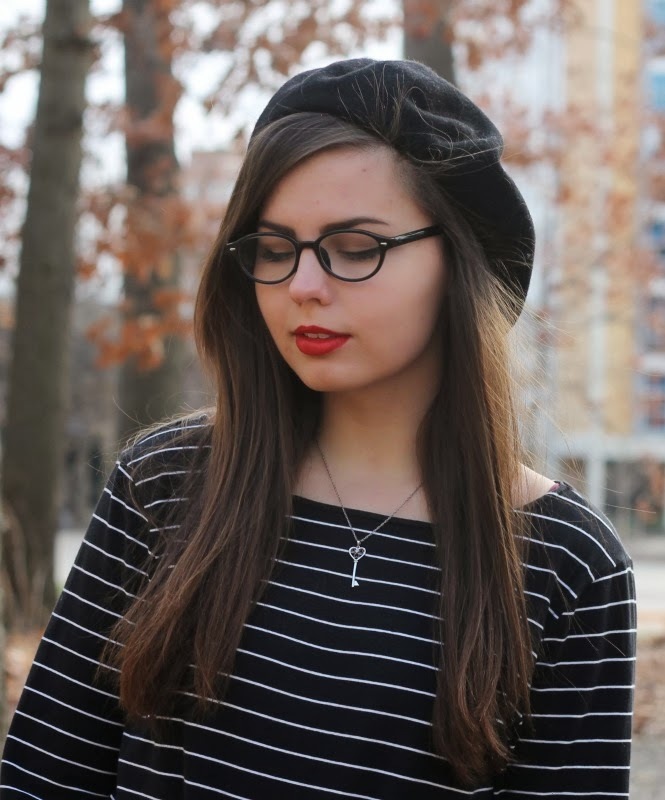 I love the beret and glasses in this outfit, too. So cute. I used to be really obsessed with obtaining a thigh gap, and I even went to my family doctor at the time to ask about how to get one. She has no idea why I wanted one, and told me that even if I was a size 00, my thighs would still touch because that's just how my bones are. And, that fixed me right up. It's terrifying that people are obsessed with this. It's unrealistic. Girl, you look stellar! 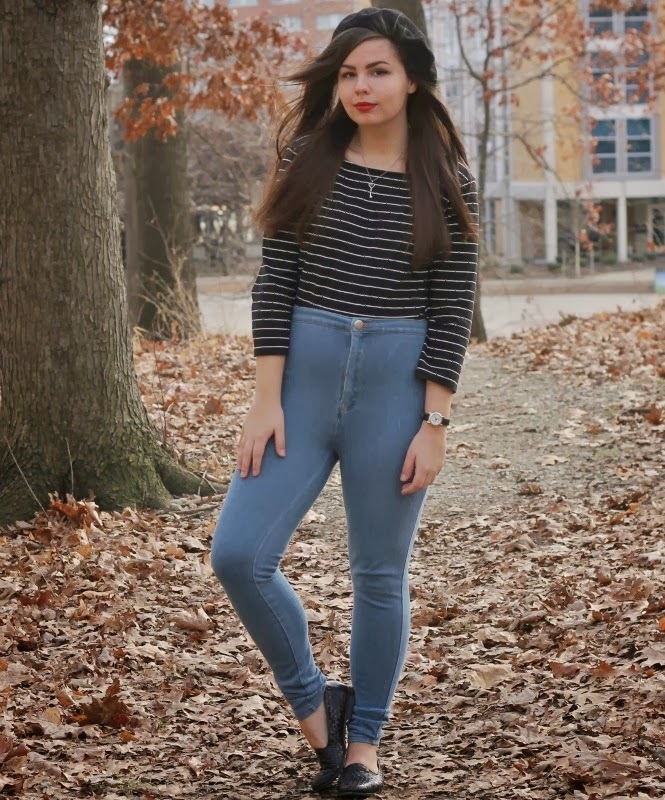 I love this outfit - you are rocking those jeans! When I first heard about the "thigh gap" trend, I couldn't believe it. WHO CARES? Seriously. Plus, I'm pretty sure that a thigh gap has to do with how you are proportioned - not necessarily with how much you weigh. But, either way, it isn't important! Thanks for this post and being such a positive role model! Guess what? Marilyn Monroe didn't have a thigh gap either, and she's still one of the sexiest women in history. I'm right there with you. You don't need a thigh gap to be considered beautiful! I agree! All my life I've been told that I'm sooo skinny, that I'm shaped like a bean pole. Well, I've never liked the idea of not having shape. I look at girls with curves with envy, because they don't realize how fortunate they are. Clothes actually fit them and they don't look anorexic. Sorry, didn't mean to rant. Having a thigh gap is not all it's cracked up to be. It doesn't matter what you look like on the outside, the inside is what counts. This post is so great! I wish more girls would realize that it doesn't take a thigh gap to feel (and BE) beautiful inside and out. Rock on!You're such a great role model! That's great Lauren! It's important to be happy with your body. I know I've waffled frequently about my self esteem-it's hard not to compare ourselves to "societies" idea of "perfect". So happy to read all this confidence and self kindness :) Really makes my heart happy the perspective you have. You are so full of love, it is obvious, and I am so glad you share that with yourself too. And I am SO happy to see you in those jeggings. Wowwowowwowwowwowowwowow!!!!! You know I am a big fan of your lovely legs and these show them off better than tights. Did I mention I was SO happy? Oh wait, I did :) But really, dear, wow! Thank you SO much for this amazing post. Between the words and pictures it totally knocked my socks off. You look amazing! 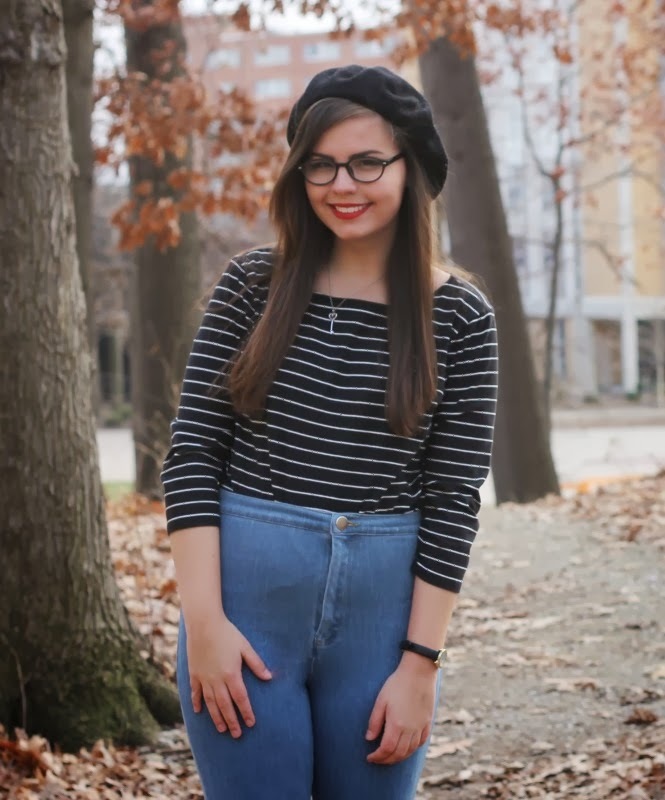 I love the whole outfit, and love your post about the ridiculousness that is the "thigh gap" trend. I also have a THIGH GAP. Imagine that. So honestly, it really really has nothing to do with how thin you are. 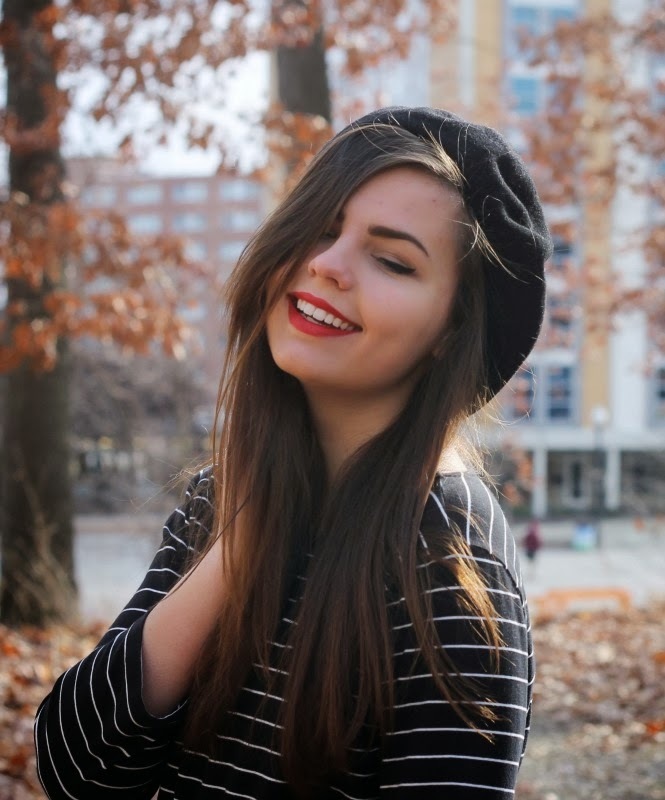 People come in all shapes and sizes and it's so good to read bloggers that embrace that!